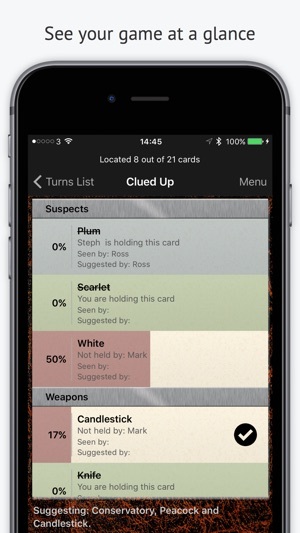 Clued Up Pro transforms your messy notes into a crisp table, showing you for each card, at a glance: who’s holding it, who’s not holding it, who’s suggested it, who’s seen it and the likelihood of it being the card in the envelope. All you have to do is enter the details of each turn. If you don’t want to give your opponents a chance Clued Up can go beyond just a smart scorecard. If you enable automatic deductions the app will cross-reference all of the turns in the game and locate cards for you, going way beyond what a human-being could achieve. Clued Up Pro works with any edition of Clue. Out of the box, it has support for the ‘Classic’ and the new ‘Discover the Secrets’ editions and many more. 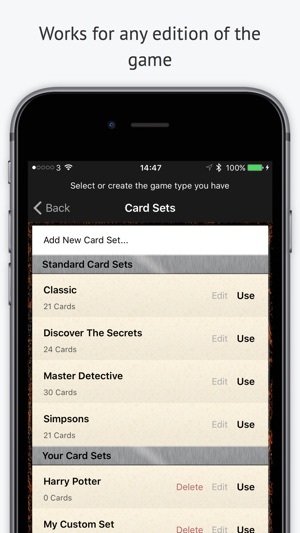 If you don’t see your edition listed you can use the card set editing feature to create any edition you like and store it in the cloud for others to use. Any feedback you can provide will be very much appreciated for future updates. Select if you want the game to automatically locate cards for you. 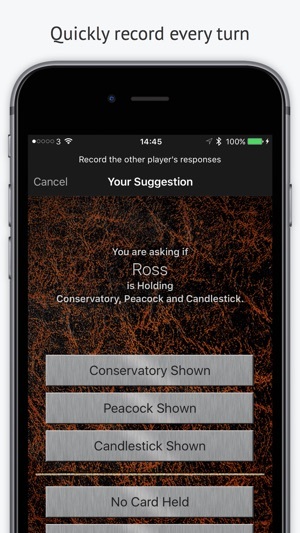 If you select to use this feature, as you record the turns in the game the app will cross-reference the location of cards from all of the player's responses and deduce for you what cards must have been shown in each go. Be sure that your opponents don’t mind you winning if you leave this switch on (or don’t tell them). On the main screen you have a list of all of the items. Eliminated items are shown in blue, items held by you in green and solved items are shown in red. Underneath the item name, you will see additional information such as who does or does not hold the card, who has suggested a card and who has seen a card. You will also see stats indicating how likely each card is to be the final item as a percentage and with the progress bar under each card. You can manually enter that a player holds or doesn’t hold a particular card by swiping the cell to the left a pressing the Eliminate/Uneliminate button. You can undo your last move if you make a mistake by pressing the menu button and selecting Undo​. Does above basic job of keeping and finding cards. Don't expect to win tournaments or higher level gameplay consistently with it tho. Liking so far! Please keep it updated! 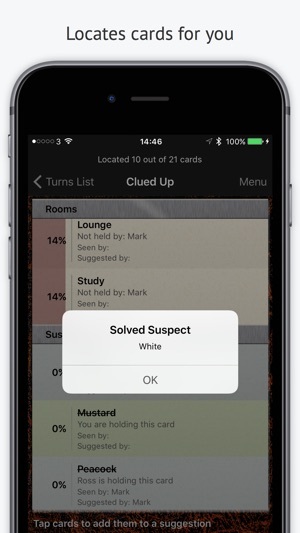 I actually play "Cluedo" on my iPhone, and it has a "clipboard" that lets you put things on it, and it puts an x for the weapon, room, and suspect that aren't held by the players, and a check for who has the card. But this will give you a probability that it's this or that player, or weapon, etc., based on the info you enter from the game. It helps me to decide who or what I want to check out next. It actually gives the same info as the clipboard, but I like how it's organized much better. A concern: I was playing an established game, and entered the players as instructed. No problems. I created my own game, for the classic players. It showed "weapons" but later it came up as "rooms". It wants to do it opposite of the app game. I can overlook that, but I entered the players (they were correctly labeled as "players") in the order they should be. Everything was fine, though they looked mixed up on my list--but I remembered that they don't show up in the order that they go in the game. And one by one, it asked for the correct player after another--until it got to me. Mrs. White should have shown me a card or not, but it skipped her, and then declared that the game was over and what I'd entered had solved it! Not the case. I will try something else. I still like the app! 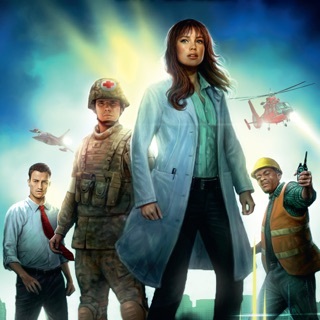 Those who have given bad ratings because they can't "play" it, or are rating it as a game? They are irrelevant and should be removed by Apple! It clearly states that it is a game "solver" or something like that, and again, when you are reading about it in the app itself, it states that it is not a game! I'm not sure why people are confused about this! This is my go-to app when playing Clue at any time, it's a major improvement over pencil and paper. The app is well done, easy to use, intuitive, and is very solid. I've never run into any major bugs. However, there is something I noticed that could be improved on. 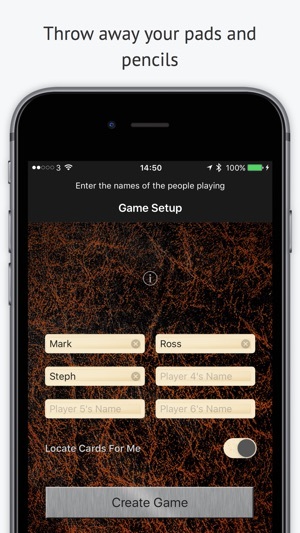 Clue: Master Detective Edition supports 10 players, but the app only lets you imput the names of 6 players which might make things very difficult should someone be playing with any number of players higher than 6. I know it seems like a minor issue, but I would like the option to input more than 6 player's names. The option could appear when you're only playing with the Master Detective editon to make it simple. All in all, if you like playing Clue but don't like using pencil and paper, I highly reccomend this app. It's well worth the purchase.